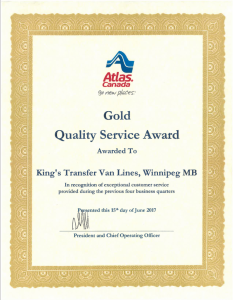 The team at King’s Transfer Van Lines Winnipeg is excited to announce that we’ve received an Gold Quality Service Award from Atlas Van Lines. In order to qualify for a Gold Award, an agent must sustain an A rating for a full calendar year. At King’s Transfer Van Lines we take great pride in our customer service and we work diligently to provide every customer with a top flight move. We literally roll out the red carpet as we enter your home. Over the years, our team has won numerous Quality Awards from Atlas Van Lines. We are also been able to maintain and A+ rating with the Better Business Beareau. When it is time to book your next move, call King’s Transfer Van Lines to ensure you receive the royal treatment.